The American politician Thomas Andrews Hendricks, Vice President of the United States in 1885, was born near Zanesville, Ohio, on the 7th of September 1819. He graduated at Hanover College, Hanover, Indiana, in 1841, and began in 1843 a successful career at the bar. Identifying himself with the Democratic party, he served in the state House of Representatives in 1848, and was a prominent member of the convention for the revision of the state constitution in 1850-51, a representative in Congress (1851-55), commissioner of the United States General Land Office (1855-59), a United States Senator (1863-69), and Governor of Indiana (1873-77). From 1868 until his death he was put forward for nomination for the Presidency at every national Democratic Convention save in 1872. Both in 1876 and 1884, after his failure to receive the nomination for the Presidency, he was nominated by the Democratic National Convention for Vice President, his nomination in each of these conventions being made partly, it seems, with the hope of gaining "greenback" votes -- Hendricks had opposed the immediate resumption of specie payments. 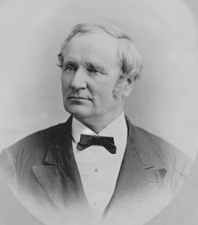 In 1876, with Samuel J. Tilden, he lost the disputed election by the decision of the electoral commission, but he was elected with Grover Cleveland in 1884. He died at Indianapolis on the 25th of November 1885.